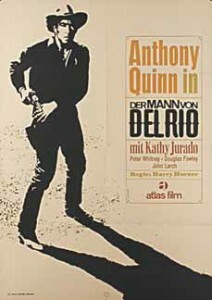 Anthony Quinn played the lead in a couple of small but good westerns in the mid-1950s. One was The Ride Back (1957), with William Conrad; and this was the other. It clearly had a small budget and a director otherwise known principally for television work, but it was good. It presents an unusual social twist on a traditional western gunfighter story, this time with a Hispanic slant. As the movie opens, gunman Dan Ritchy rides up to a saloon in the town of Mesa, a quieter version of Hays City, Ellsworth and Dodge City on the cattle trails north from Texas to the railroads in Kansas. 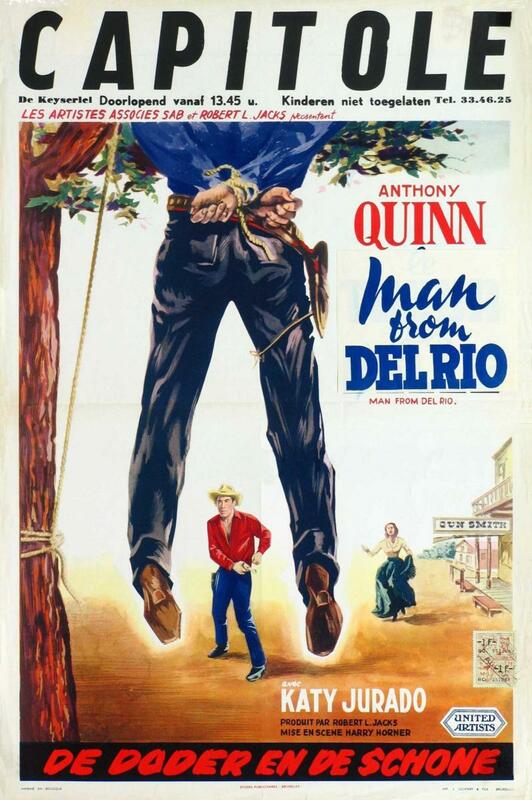 He encounters a down-at-the-heels cowboy, who stops him and asks if he remembers Del Rio five years ago, where he killed three men. A fourth was with them: Dave Robles (Anthony Quinn), who says that it has taken him five years to learn how to use a gun. He’s wounded in the exchange, but Ritchy is dead. Dave Robles (Anthony Quinn) apparently owns the town after taking down Dan Ritchy. The cantankerous local doctor, Doc Adams (Douglas Fowley), whose sign advertises that he is also the dentist, undertaker and veterinarian, patches Robles up, and Robles meets the doc’s housekeeper and medical assistant Estella (Katy Jurado). Back at the saloon, the proprietor Ed Bannister (Peter Whitney) chats Robles up. He claims to have been a gunman when he was younger, and he apparently invites gunmen to town (as he did Ritchy) in the hopes of finding one that will buy into his vision of the town as a more vigorous trail town. As Robles tries to get to know Estella better, she’s having none of him. 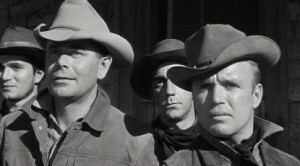 Three more of Bannister’s potential gunmen come to town, and they tie up the sheriff in a tree to use for target practice. When they want to make off with Estella, Robles shoots it out with them and wins. (If one of the three looks familiar, that’s because it’s Guinn “Big Boy” Williams, in an uncredited role.) Impressed, the local town fathers offer him the job of sheriff at $100 a month and lodging, along with new clothes. 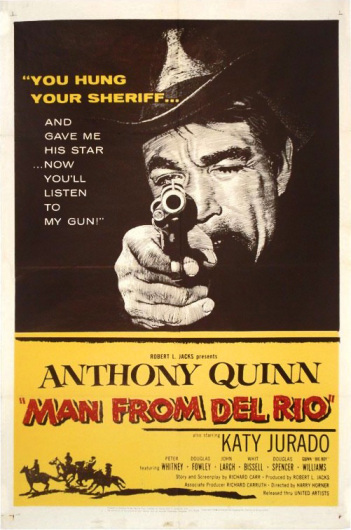 Dave Robles (Anthony Quinn) has reason to be wary, even after he is made sheriff of Mesa. And Estella (Katy Jurado) tries to dissuade Robles from a showdown with Bannister. But the job and situation are not as good as Robles thought. Social acceptance does not come with the job, and when he attends a dance, neither Estella nor any of the other respectable women in town will dance with him—apparently because he is Latino and a gunman. When Ed Bannister renews his offer because Robles is drinking heavily and feeling ostracized by the community, the two get into a fight. Robles wins, but he breaks the wrist on his gun hand. Notwithstanding that, he is successful at running out a young gunman who thinks he can go along with Bannister’s plan. And he gives Bannister until noon the next day to leave town. 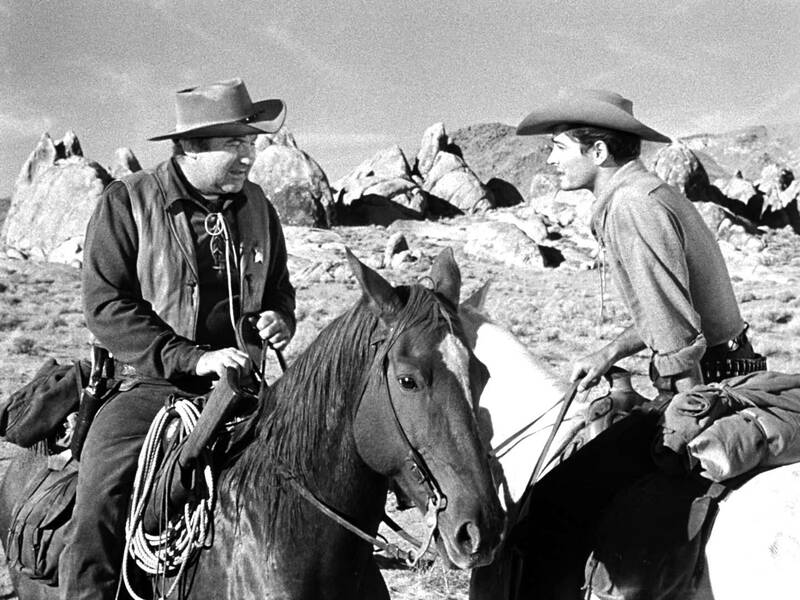 Dave Robles (Anthony Quinn) marches to his apparent end against Ed Bannister (Peter Whitney, left). Well, watch it and see. The result is both consistent with Robles’ character as we have come to know it, and with his medical situation. Although it’s not a long movie at all, it takes its time as Robles develops from the penniless, good-with-a-gun near-alcoholic he was at the start to whatever he may be at the end. Like The Ride Back, this is largely a character study, and it’s good, if not quite as good as The Ride Back. Both Anthony Quinn and Katy Jurado were very good actors, and they carry this film, although Estella’s transition to being fond of Robles is sudden and not entirely persuasive. For Anthony Quinn as a quasi-villain in bigger westerns, see Last Train from Gun Hill (1959) and Warlock (also 1959), where he brings a dimension of humanity to what would otherwise be standard bad-guy roles. Katy Jurado is remembered mostly for her excellent performance in High Noon, but she’s also good in The Badlanders (1958), with Alan Ladd. 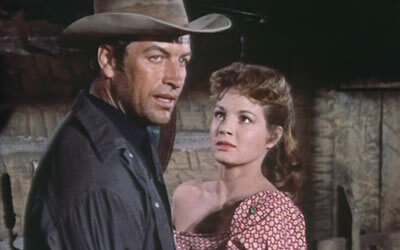 Peter Whitney has another role as a bad guy in Domino Kid (1957), with Rory Calhoun. 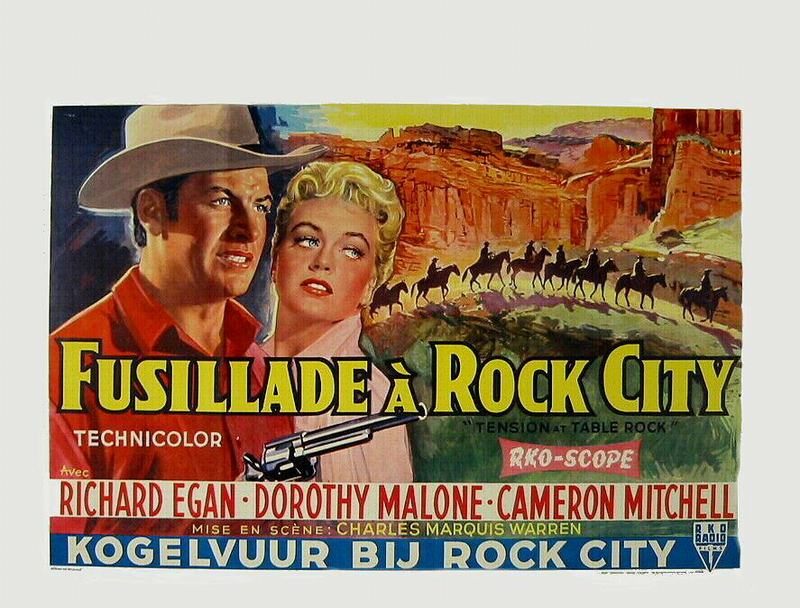 Filmed In black and white at Gene Autry’s Melody Ranch in Placerita Canyon in southern California (destroyed by fire in 1962), at 82 minutes. This entry was posted in Westerns Worth Watching and tagged Anthony Quinn, Lawman and Community on April 27, 2015 by Nicholas Chennault. 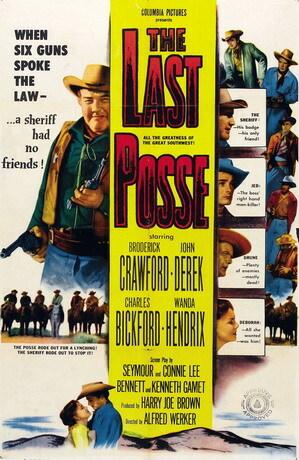 Aging, heavyset Broderick Crawford would seem to make an unlikely leading man, but he was the lead in two “last” westerns in 1953: The Last Posse and Last of the Comanches. He’d won the Best Actor Oscar for playing Willie Stark in All the King’s Men (1949) and was moving more into television work, where he would make his mark in Highway Patrol. 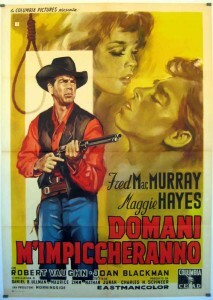 And he still had a few westerns left in his career. 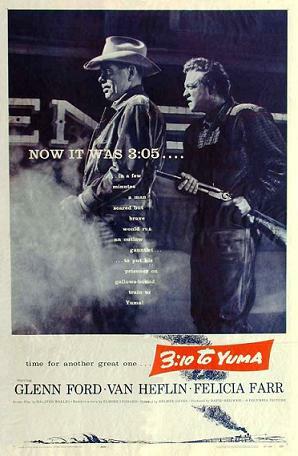 This one takes place in Roswell, New Mexico, where the sheriff is hard-drinking John Frazier (Broderick Crawford), who once played a significant role in cleaning up the town. Now it’s mostly peaceful, but not as peaceful as it may seem. The posse of the title rides back into town at the start of the film, weary and with Frazier seemingly wounded, but without prisoners or stolen money. Most of the story is told in flashbacks. 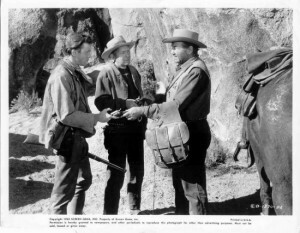 Sheriff John Frazier (Broderick Crawford) gives a whiskey drummer (Henry Hull) some backstory on Sampson Drune. 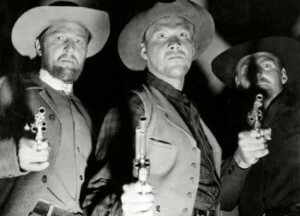 The three Romers, rancher Will (Todd Mitchell) and his sons George (Guy Wilkerson) and Art (Skip Homeier) have been unfairly treated by bigger rancher Sampson Drune (Charles Bickford at his most cantankerous). When they seek redress, they get into a fight with Drune’s adopted son Jed Clayton (John Derek). Drune concludes a big cattle sale for $205,000 and attempts to deposit the money in the local bank, when it is stolen by the Romers, who take off into the desert with it. Drune and Clayton head the posse chasing them, which includes the most prominent of the local citizens—the banker and the store owner among them. Frazier is given an out, but he joins them, too. He knows, as Jed does not, that Drune killed Jed’s father, and Frazier suspects that Drune has something similar in mind for the Romers, who also know what he’s done. 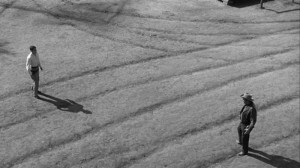 During the pursuit in the desert, Drune and Clayton get ahead of the rest of the posse, but Frazier knows the desert well and cuts them off. Drune knocks Frazier off his horse, but Frazier nevertheless reaches the Romers first as they seek refuge in some rocks. As they try to get away, George Romer falls to his death, and Will and Art surrender to Frazier. 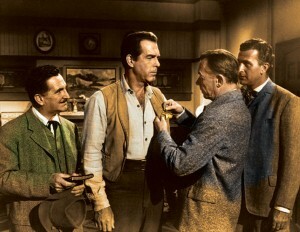 The two remaining Romers surrender to Sheriff Frazier (Broderick Crawford). [Spoilers follow.] As Frazier takes custody of the two arrested Romers, the rest of the posse rides up. Sampson Drune guns down both Romers, and gets Frazier at least twice as well, as Frazier tries to tell Clayton the truth about Drune. Clayton reflexively kills Drune. By the time the posse arrives back in Roswell, Frazier is in very bad shape. Posse members have agreed to tell a story that has all Romers and Drune being killed in a shootout in the desert. Clayton will inherit the large Drune ranch, and the others will split up the $205,000, after claiming it was lost in the desert. As the judge starts an inquest that evening, things proceed as planned, except that Frazier struggles into his clothes and with great difficulty takes a seat at the proceeding. His presence convinces Clayton to tell the truth to the judge about what happened. 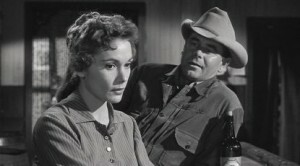 At the end Clayton re-unites with girlfriend Deborah (Wanda Hendrix), and it is discovered that Frazier had died of his wounds about the time he sat down. They didn’t need to tell the truth after all, leaving the town’s leading citizens to wallow in their own collective hypocrisy. John Frazier (Broderick Crawford) and Jed Clayton (John Derek) confer. Crawford makes an effective sheriff here, the most honest character in the movie although he is either drunk, hung over or badly injured for much of the film. He does some strenuous riding in the desert, down steep slopes and falling off his horse at least three times, where it is apparent that it is a skinnier stunt double doing the riding and falling. 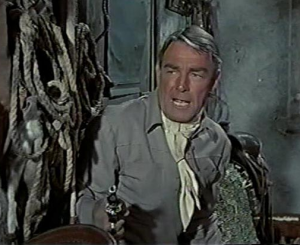 Skip Homeier does his usual “kid with a gun” sort of performance (The Gunfighter, Ten Wanted Men, Dawn at Socorro, The Tall T, Comanche Station) in a limited role. 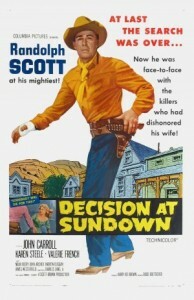 He was never a leading character in them, but he managed to be in a surprising number of good westerns. Charles Bickford is unpleasant (as he could be in real life, apparently; see The Big Country), spiteful and unscrupulous the entire movie. John Derek does not seem to be much of an actor, and will soon move into photography and become better known for his series of wives than for his acting career. Wanda Hendrix’s character is extraneous. The fussy Henry Hull is a whiskey drummer to whom Frazier tells key parts of his story. 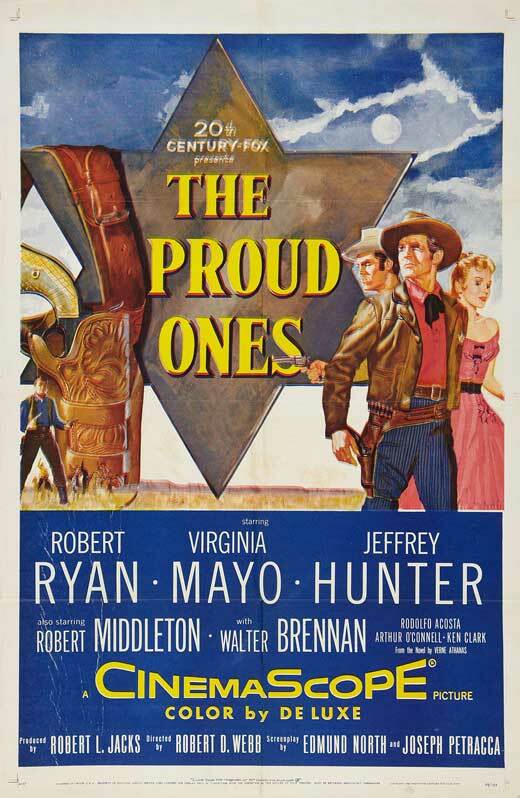 This was produced by Harry Joe Brown, experienced with westerns and now remembered principally for his work with Randolph Scott and Budd Boetticher. In black and white, with a lot of plot for 73 minutes. 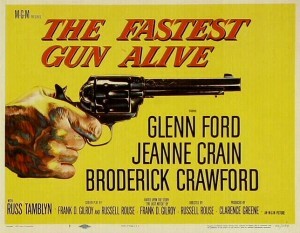 For Broderick Crawford in another western role, see him as bad guy Vinnie Harold, challenging Glenn Ford in The Fastest Gun Alive (1956). 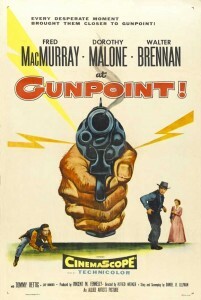 Director Alfred Werker also made At Gunpoint (1955), with Fred MacMurray. This entry was posted in Westerns Worth Watching and tagged Lawman and Community, Manhunts on April 2, 2015 by Nicholas Chennault. 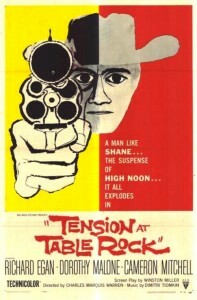 A variation on the High Noon theme, which was made two or three years earlier than this movie. 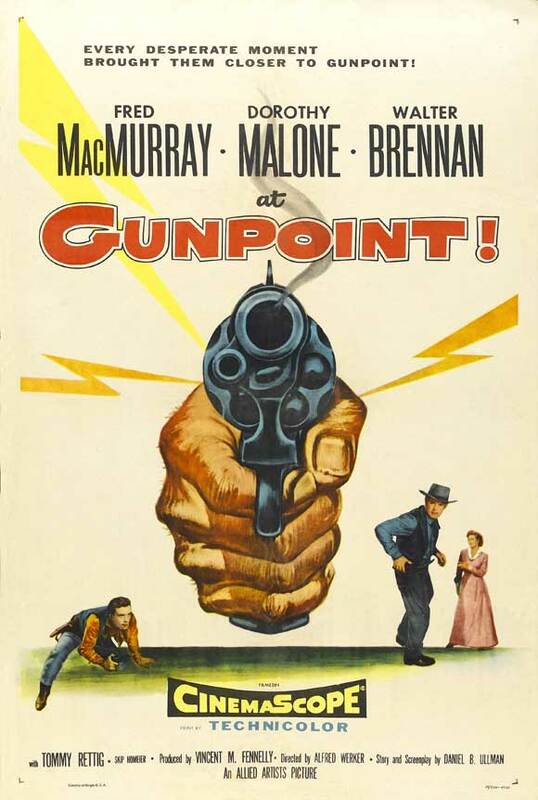 Peace-loving storekeeper Jack Wright (Fred MacMurray) kills the leader of an outlaw gang by a stroke of luck while they’re trying to rob the local bank. 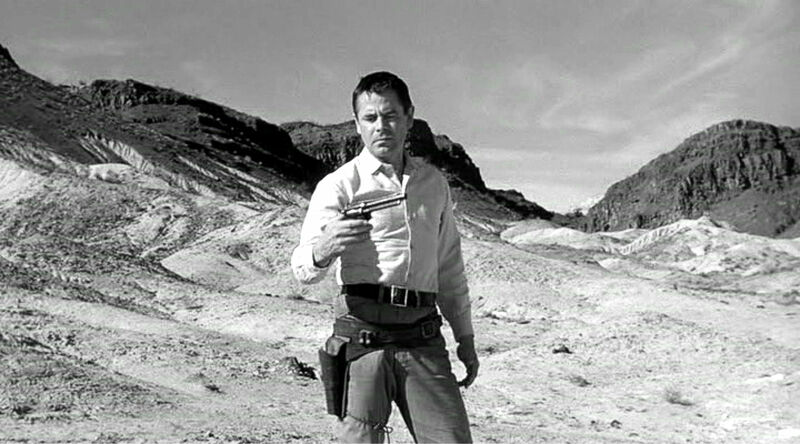 Hailed as a hero, Wright realizes deep down that he’s a coward, and, more obviously, he’s not really any good with a gun. When the surviving gunmen return to town, thirsting for revenge, the townsfolk expect Wright to singlehandedly stand up to the villains. When he asks for help, his neighbors turn their backs on him, ordering him to get out of town to avoid further trouble. 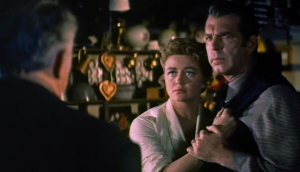 Only the doctor (Walter Brennan) and Wright’s wife (Dorothy Malone) remain loyal. Ultimately, Wright finds that he may not be as cowardly as he had thought. 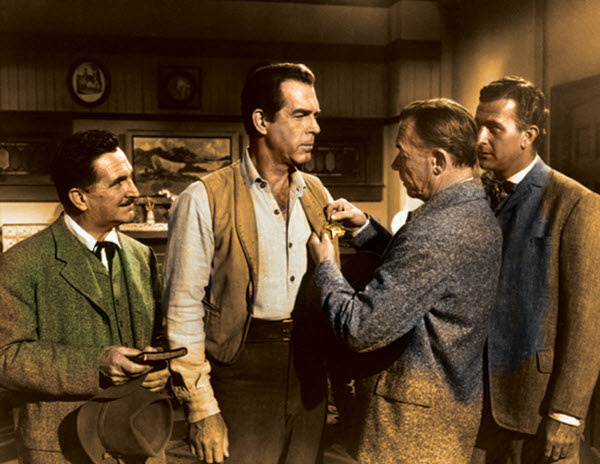 After Wright gives a stirring speech in a saloon, the townspeople do come to his aid and the gang is captured. 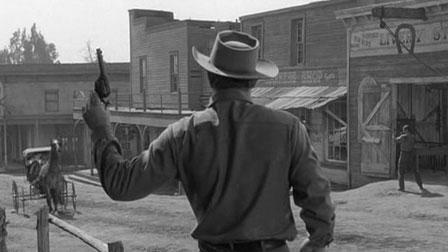 This is different from High Noon in that the man in danger has not deliberately taken that risk—he’s not a marshal or sheriff—and because eventually the town does stick up for him. Kind of talky. 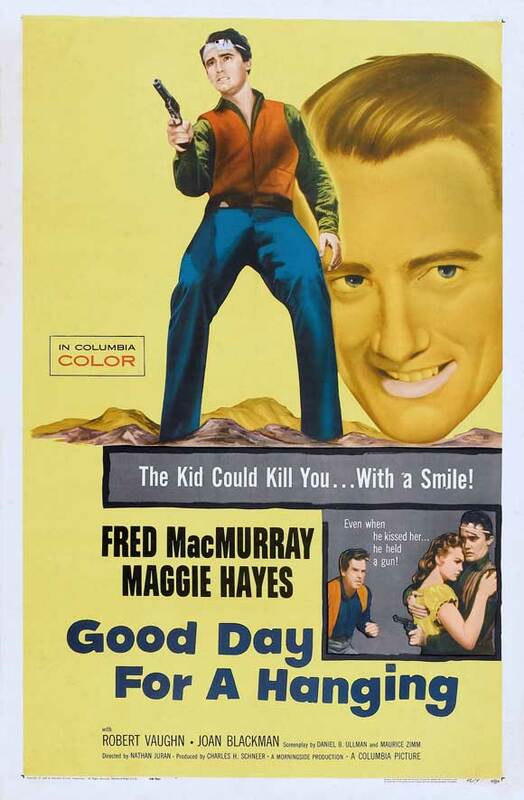 Good performance by MacMurray; his son is played by Tommy Rettig, who went on to star in Delmer Daves’ The Last Wagon and in television’s Lassie. 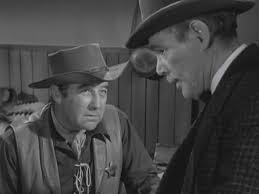 The crusty but beloved town doctor (Walter Brennan) is essentially the same character as John McIntire in The Tin Star. 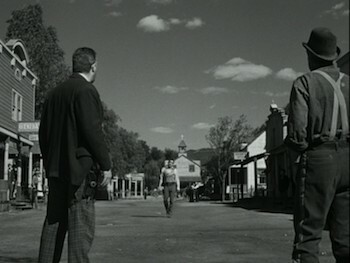 This is one of those 1950s westerns dwelling on the interaction between a town and its sheriff, the nature of community and the kind of support a sheriff should expect from those he protects. 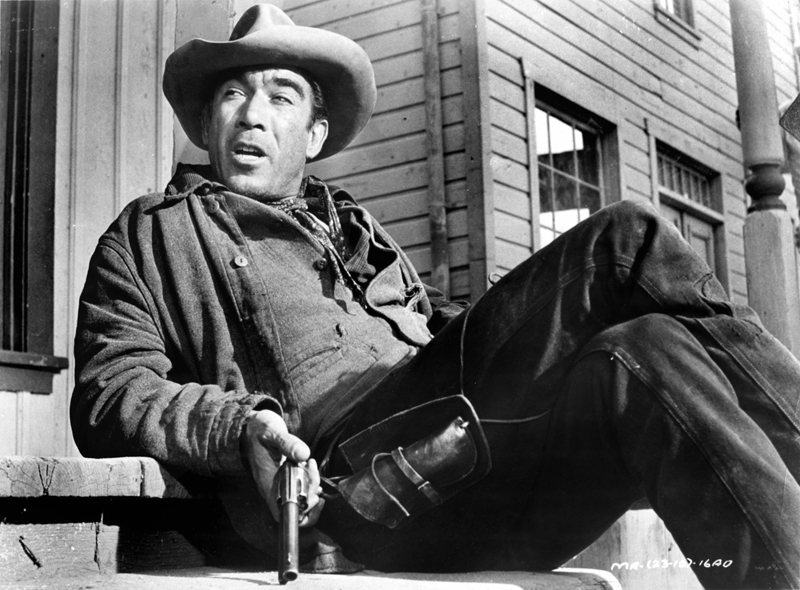 The most famous is High Noon, but see also The Tin Star, Warlock and Rio Bravo, as well as the later Lawman. 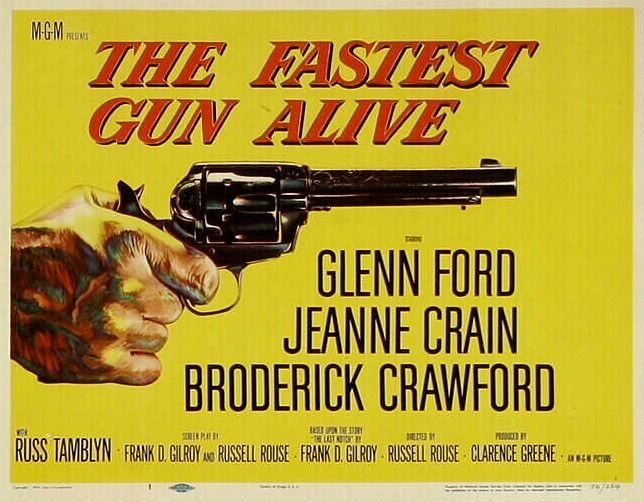 This also bears some resemblance to The Fastest Gun Alive a couple of years later; the difference is that Glenn Ford in Fastest Gun is good with a gun but doesn’t want to use it. The cowardly townspeople were becoming a cliché by the time this movie was made. Another comparison might be with 1967’s Hombre, in which Paul Newman has been rejected by others for living as an Apache. He clearly owes them nothing, but nevertheless comes to their aid against his own inclinations simply because he is the one best suited to do so. In color, at 81 minutes. This entry was posted in Westerns Worth Watching and tagged Dorothy Malone, Fred MacMurray, Lawman and Community, Psychological Westerns, Walter Brennan on May 3, 2014 by Nicholas Chennault. 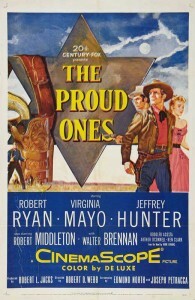 The title apparently refers to aging town marshal Cass Silver (Robert Ryan) and young Thad Anderson (Jeffrey Hunter) in Flat Rock, Kansas, a cow town. 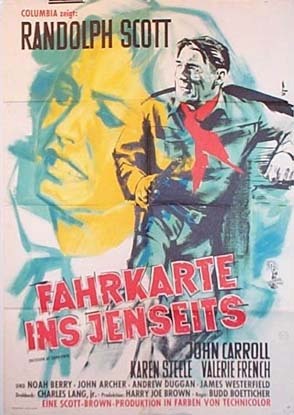 Early in the movie, Cass has a run-in with a dealer in a saloon run by Honest John Barrett (Robert Middleton, good here in his slimy mode), with whom he has a long and none-too-cordial history. 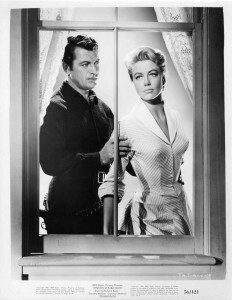 Silver, Barrett and Sally (Virginia Mayo) all knew each other in Keystone, where Silver was previously marshal. A bullet creases Cass’s head and leaves him with impaired vision, and maybe dizziness, when he looks down. Thad Anderson, just in with a trail herd from Texas, saves Silver from another gunman in the incident but takes a bullet in the leg. Barrett’s public relations campaign with the locals seems to be working; the townspeople are increasingly uncomfortable with Cass and his skill with a gun. Barrett spreads stories about Cass shooting unarmed men, including Thad’s father. Cass in turn doesn’t know who he can really depend on, if anyone, since his deputy has a long-term grudge against him that he’s never hidden. When the chips are down, though, Thad joins with Cass. In the final shootout with Barrett’s men, Cass and Thad prevail and bond further. 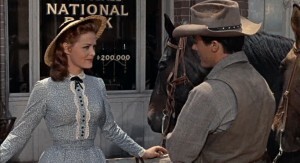 Cass goes off to Kansas City for medical attention and to marry Sally. A good B-movie cast. Virginia Mayo is a local businesswoman and Silver’s long-time romantic interest, but she has little to do here except express concern. 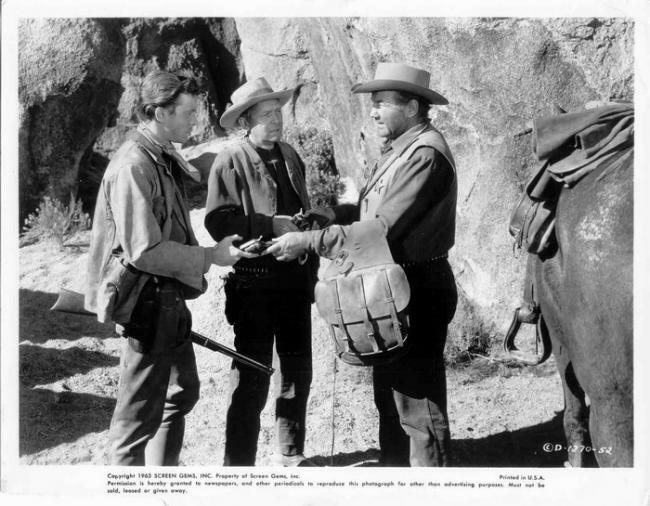 Walter Brennan is the jailor-deputy Jake, Arthur O’Connell is a nervous Silver deputy, and Rodolfo Acosta is Chico, a Barrett gunslinger trying to kill Cass. In color, with cinematography by Lucien Ballard. Lots of whistling on the effective soundtrack music by Lionel Newman. 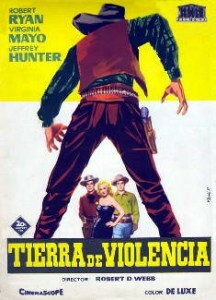 This is said to be a remake of the non-western Red Skies of Montana from four years earlier, also with Jeffrey Hunter. 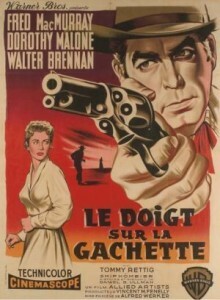 It can also be seen as another 1950s western exploring the uneasy relationship between the townsfolk and the good-with-a-gun marshal they hire to defend them. 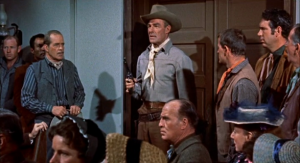 More explicitly, it can be seen as a variation on the Rio Bravo aspect of that theme, as emphasized by the presence of Walter Brennan as the jailer. Better than average, but kind of talky. 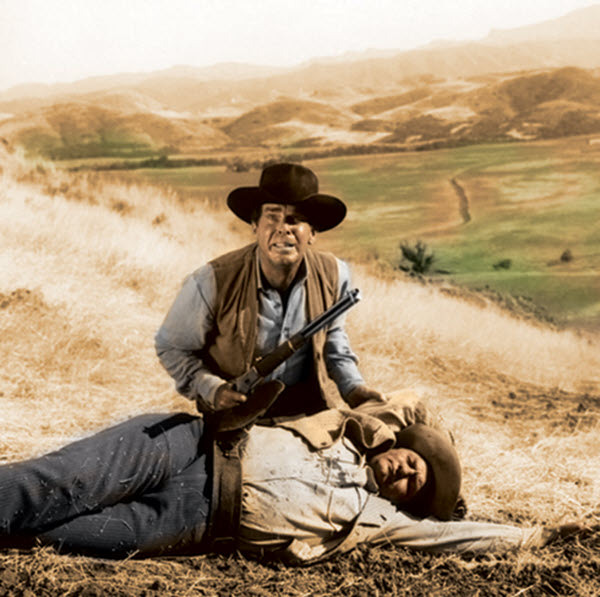 If you like Robert Ryan here, watch him in Day of the Outlaw from about the same time and as a supporting character to Burt Lancaster in Lawman from the early 1970s. This is one of Jeffrey Hunter’s better roles, although he was always limited as an actor. 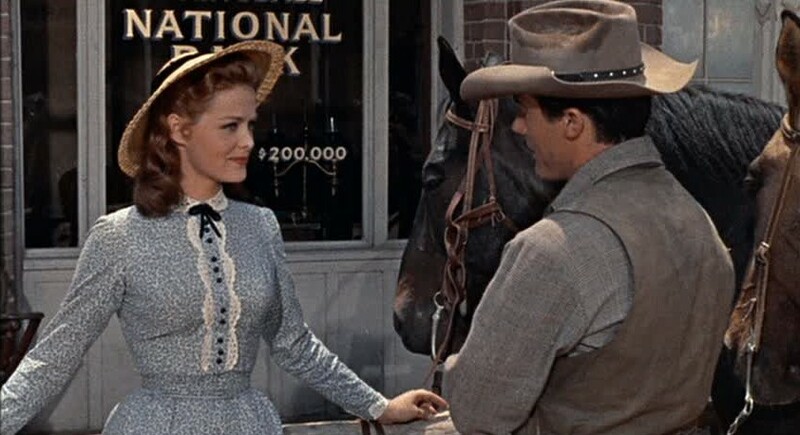 This entry was posted in Westerns Worth Watching and tagged Jeffrey Hunter, Lawman and Community, Lucien Ballard, Robert Ryan, Virginia Mayo on March 10, 2014 by Nicholas Chennault. 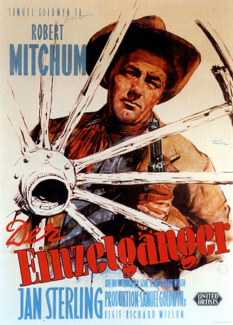 Robert Mitchum is Clint Tollinger, who is made marshal in the town of Sheridan in order to clean it up. Sheridan is controlled and terrorized by Dade Holman (Joe Barry), the local land and cattle baron. Tollinger specializes in quick taming of wild towns and is good with a gun, but the town becomes uncomfortable because of that, especially when some businesses suffer. Tollinger is in town to see his estranged wife Nelly Bain (Jan Sterling), who is madam of a bunch of unusually attractive “dance-hall girls” (including a very young and uncredited Angie Dickinson as Kitty). Impetuous young swain Jeff Castle (John Lupton) gets shot by Holman’s men, and his girl friend (Karen Sharpe) seems to be transferring her affections to Tollinger. Tollinger can take care of most of the trouble and politics thrown at him until the madam reveals the fate of their daughter. 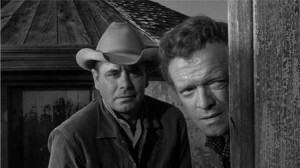 Unbalanced emotionally by the news, Tollinger then burns down Holman’s saloon and shoots it out with its manager Frenchy Lescaux (Ted de Corsia) after goading Lescaux into the confrontation. Holman develops a trap for Tollinger; in the final shootout, Tollinger wins but is shot when he defers to the swain at the last moment so he can look good for his girl. Presumably Tollinger’s wound is not fatal, though. 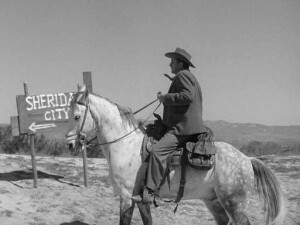 Tollinger (Robert Mitchum) rides into the town of Sheridan. 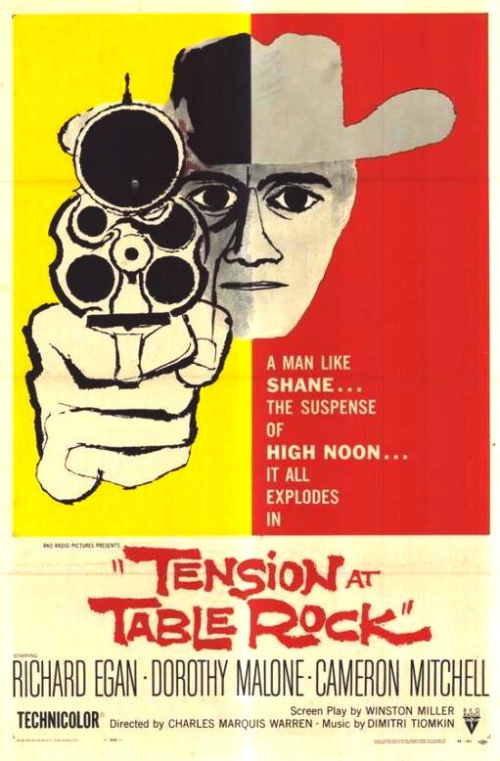 Kind of a western-noir, this compact movie is one of those westerns from the 1950s dealing with the uneasy relationship between a gun-slinging law enforcer and the townsmen he’s protecting (High Noon, The Tin Star, Warlock, Lawman, etc.). It’s also a gunslinger coming to terms with his past (The Gunfighter, Lawman, The Shootist, etc.) Mitchum is very good at playing a character who is quite competent but possibly more on the edge than anybody realizes, with unresolved fatherhood issues in this case. The resolution of the movie doesn’t feel entirely satisfying. Facing down bad guys from the upper story of a barn. 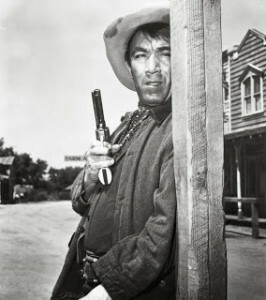 Claude Akins, never a subtle bad guy, has a small role as Jim Reedy, one of Holman’s gunmen, who tries to get Tollinger with a gun hidden in his hat. 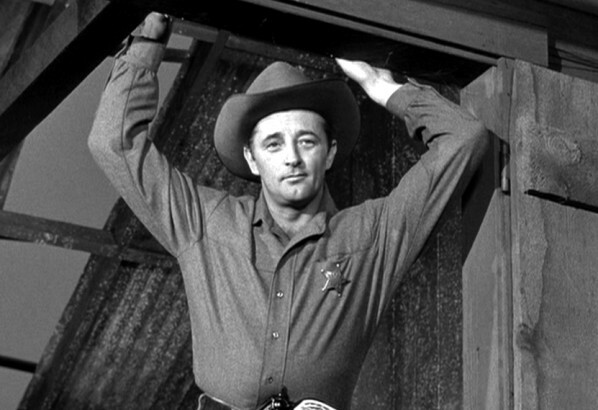 Henry Hull is the sheriff and Tollinger’s deputy in a colorful role verging on irritating. James Westerfield is a supposed traveling drummer, who’s actually Holman’s lawyer; he’s a bit unctuous in the role. Joe Barry, who plays Holman, isn’t seen until the film’s climax, and that works quite well. 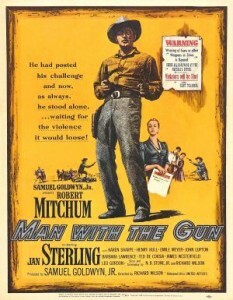 Except for Mitchum, there’s not much star power here. 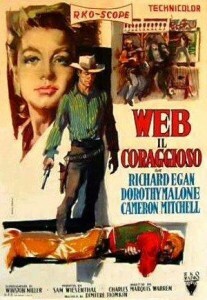 Better than most westerns, this is worth watching, although not often seen any more. Shot on a back lot in black and white; the town has an unusual hillside feel to it. The cinematographer was Lee Garmes. Music is by Alex North, who later did Spartacus and recycled some of the music from this in it. Director Wilson, a protégé of Orson Welles, did a similar movie again with Yul Brynner in Invitation to a Gunfighter in 1964. This one is better. 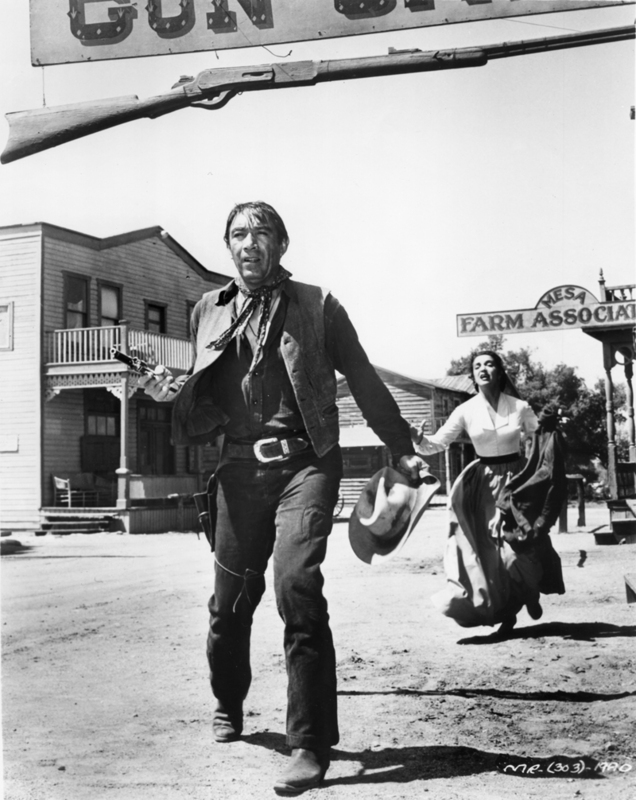 This entry was posted in Westerns Worth Watching and tagged Lawman and Community, Robert Mitchum, Town Taming, Westerns Noir on January 3, 2014 by Nicholas Chennault. Unlike most of the other Ranown westerns of the late 1950s, this one takes place mostly in a town. The opening shot is not a lone rider making his way through the distant rocks of Lone Pine. 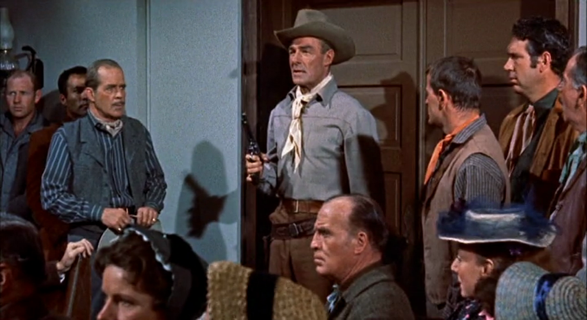 And the normally solitary Randolph Scott character has a sidekick played by the amicable Noah Beery, Jr.. And it’s written by Charles Lang, not Burt Kennedy, who wrote the best of the Ranown westerns directed by Budd Boetticher. There are stories, however, that Kennedy did most of the writing without being credited. However, Bart Allison (Scott) is seeking vengeance for matters relating to the death of his wife, as is usual with Scott characters in Boetticher movies. He’s after Tate Kimbrough (played slimily by John Carroll), the corrupt town boss of Sundown, who’s about to marry spunky and beautiful young Kate Summerton (Karen Steele, who was Mrs. Budd Boetticher). Allison is a Civil War veteran who’s heard that a dalliance with Kimbrough while he was gone led to his wife’s suicide. There are good side characters in this one: Ruby James (Valerie French) is Kimbrough’s long-time living-above-the-saloon paramour who’s not entirely reconciled to the marriage; Doc John Storrow (John Archer) has his own questions about Kimbrough, as does local rancher Morley Chase (Ray Teal). By speaking up at Kimbrough’s wedding, Allison and Sam immediately are hunted by Kimbrough’s minions, including his pet sheriff (Andrew Duggan). The battle takes most of the movie, as Kimbrough’s men take out Sam and Allison kills the sheriff. In the end, however, though Kimbrough is a moral leper, he doesn’t actually deserve Allison’s vengeance because Allison’s wife dallied with a number of men. The resolution is interesting; Allison gets his revenge, but not the way he thought he would. And he’s not happy about it. He’s not as admirable a hero as most of the Scott-Boetticher characters. This is yet another case where the hero played by Scott doesn’t get Karen Steele, who probably ends up with the doctor. This is an interesting variation on the cowardly townspeople theme, though. (High Noon, At Gunpoint, The Tin Star, the original 3:10 to Yuma, etc.) 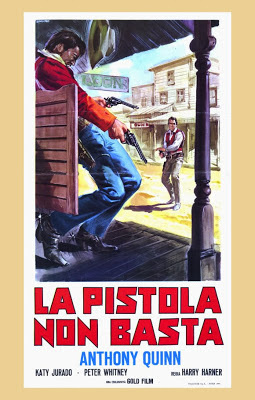 It’s not, perhaps, one of the very best of the Ranown westerns, but better than an average western nevertheless. This entry was posted in Westerns Worth Watching and tagged Budd Boetticher, Lawman and Community, Randolph Scott on November 28, 2013 by Nicholas Chennault.